Dunblane is one of the country's smallest cities but has a rich and colourful heritage that far outweighs its size. The story of this charming city is interwoven with that of its magnificent Cathedral. Come and discover Dunblane and Sheriffmuir. Dunblane was founded in 602 A.D. by the Celtic missionary St. Blane (from whom the city derives its name). He lived with his followers in beehive shaped stone cells inside the old Dun or hill fort behind the town. St. Blane founded a church here and became one of the most prestigious churchmen of his time, known as 'Blaan the Triamphant'. 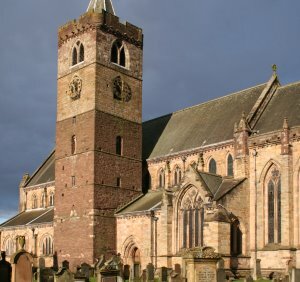 After St. Blane's death (640 A.D.) Dunblane became a stronghold of the Culdee church who were probably responsible for building the lower four storeys of the cathedral tower. However, it was not until 1240 and the arrival of the 8th bishop, Clement, that building work began on the cathedral as it can be seen today. From then on Dunblane became an important centre of church and state. For many centuries the focal point of Dunblane has been its magnificent cathedral, which dates back in part to the 12th century and is one of Scotland's few surviving medieval churches. Viewed from the outside, the Cathedral is an impressive sight, but its true beauty lies within. A sentinel of towering pillars and archways of weathered stone stand guard in the nave, overlooked by colourful religious icons of stained glass. The decorative woodcarvings are an added glory and each of the floral carvings on the Scots oak pews is unique. In front of the alter lies three slabs of Tournail limestone marked as the resting place of Margaret Drummond, and her two sisters, who was reputed to have been the secret wife of King James IV. 3 miles east of Dunblane is the secluded spot of Sheriffmuir. It was here on the 13 November 1715 that a Jacobite uprising culminated in the bloody battle of Sheriffmuir. It was an inconclusive battle in which the right wing of each army overcame the opposing left wing and in the end neither could truly claim victory. An old Scots ballad immortalised the battle with the words "some say that they won, and some say that we won, and some say that none won at a". The great burial mounds are still visible as is the gathering stone where the powerful Duke of Argyll is said to have watched the opposing Jacobite army gather. Today Sheriffmuir is a hauntingly desolate spot that offers superb views and has a charming hostelry. The Jacobite cause touched the Dunblane area once again in 1745 when Bonnie Prince Charlie stayed at Balhaldie House on his way south with his Highland army. Ironically six months later the Duke of Cumberland stopped at Dunblane while pursuing the prince and his army now in retreat. A serving girl from Balhaldie House nearly altered the course of history by throwing down a pail of boiling oil at the Duke which narrowly missed him. The coming of the railway in 1845 brought prosperity back to the town and large villas were built for wealthy Victorian commuters. The huge Hydro, now a luxury hotel, was built as a spa in 1875 to take advantage of the local mineral waters. The magnificent cathedral was restored to its original glory in 1889 and is full of splendour and medieval treasures. As John Ruskin wrote "He was no common man who designed the cathedral of Dunblane. I know of nothing so perfect in its simplicity, and so beautiful in all Gothic with which I am acquainted". Visitors to this ancient city can enjoy its rich history! Today Dunblane still exudes an olde worlde charm where examples of seventeenth and eighteenth century architecture blend with Victorian and more modern buildings. The old town remains a quiet atmospheric place which provides many 'touchstones' of bygone times. The city clusters around the bridge over the River Allan and visitors can enjoy a pleasant stroll by the river banks or continue further along the Darn Walk to the nearby town of Bridge of Allan and to Stevenson's Cave, so named because the writer Robert Louis Stevenson is reputed to have composed some of his famous novels here. Less than half a mile from the town centre are the Laighills and Ochlochy Park, also offering excellent walking opportunities as well as a number of tranquil and secluded spots for picnicking. The architecture of the old town of Dunblane is truly magnificent especially around the cathedral, in the medieval square, where there are delightful 18th century houses. Open to visitors is the Dean's House of 1624 which contains the Cathedral Museum with its fascinating exhibits while the Leighton Library(1681) contains over four thousand rare books. The historic suburb of Ramoyle is largely unchanged except that the thatched roofs of the whitewashed weaver's cottages are now slated. The Leighton Library is the oldest private library in Scotland and was founded by Robert Leighton (1611-84), Bishop of Dunblane. The library building was completed in 1688 and housed the Bishops private book collection. The cost of the building was kept to a minimum by using fallen stone from the nearby Bishops's Palace. The rare collection of books has since swelled from the original 1,400 books bequeathed to some 4,500 volumes on a variety of subjects and printed in 80 languages. Visitors to this impressive literary collection are given the rare opportunity to handle some of Scotland's rarest books, the oldest, a book of Psalms dates back to 1504. The collection includes Samuel Johnson's Dictionaries and many first editions, such as Sir Walter Scott's 'Lady of the Lake'. Dunblane is close to some of Scotland's finest scenery. However, there are two park lands within the city that deserve a special mention. Ochlochy Park, once common land for cattle grazing, was gifted to the people of Dunblane as a children's play area in 1942. The name of the park derives from the Gaelic, meaning 'The Little Loch in the Field'. This definition aptly sums up Ochlochy Park and a popular pastime for the local children is feeding the families of ducks on the miniature loch. The Leighills, a major fortified camp in pre-historic times, nowadays offers excellent walking opportunities as well as an equipped children's play area. The Darn Walk (or Daurinn Road) is aptly named as it comes from an obsolete Gaelic word meaning The Water Road. This charming riverside pathway, thought to have been in use since Roman times, connects Dunblane with the nearby community of Bridge of Allan. Along the walk look out for the remains of Pictish houses and the cave associated with the famous writer Robert Louis Stevenson. Stevenson composed many of his literacy masterpieces here and described the cave as 'a cavern by the side of a wide meadow which has been part of me the last twelve years or so'.